The Sherwood Guest House Guest HouseThe Sherwood is a late Victorian Town House operating as Seaside AA 4 star Guest House accommodation. A warm welcome is always assured by the owners, Carole & Bo, and a small team of friendly and long time trusted staff. Situated in a prime location for the seafront, theatres, art gallery, conference centre, grass tennis courts and the town shopping centre only a short walk away. The Sherwood has an excellent reputation for its superb breakfast. We offer an extensive buffet of juices, cereals, fresh fruit and yogurts, teas and coffee. A choice of cooked breakfast to your taste and vegetarian if you prefer that, toast and preserves. All our rooms have en-suite facilities, all rooms have showers, some also have baths. We have single, twin and double rooms and a number of family size rooms that can accommodate from three to five persons. Our Superior size family room has a king size bed in the main bedroom and a separate adjoining full-size bunk bed room. The Superior room also features a balcony with a sea view. We have flat screen TV with Freesat, radio alarm clocks, tea/coffee-making facilities in all guest rooms. On Street Parking available for £1 per day in Zone H.
We also have a beach hut available for our guests to use on a first come first served basis. The Sherwood Guest House sometimes limits bookings to 4 or more days. Double 11 sometimes limits bookings to 2 or more days. Double-bedded room, situated on entrance level with en suite shower room. Rear view. Flat Screen Tv with Freesat, Radio Alarm Clock, Tea/Coffee-making facilities, co-ordinating furnishings. Double 2 sometimes limits bookings to 2 or more days. Double-bedded room, situated on 1st floor, with en suite shower room. Rear view. Flat Screen Tv with Freesat, Radio Alarm Clock, Tea/Coffee-making facilities, co-ordinating furnishings. Double 4 sometimes limits bookings to 2 or more days. 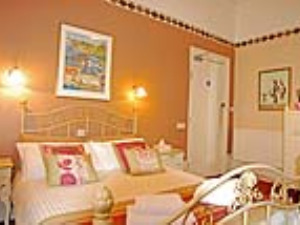 Twin or large double (super king) bedded room, situated on 2nd floor, with en suite shower room. Rear view. Flat Screen TV with Free sat, Radio Alarm Clock, Tea/Coffee-making facilities, coordinated furnishings. Twin or double sometimes limits bookings to 4 or more days. 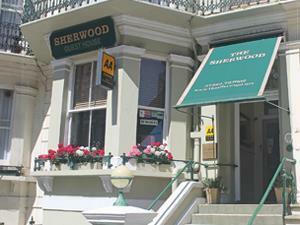 The Sherwood is a late Victorian Town House operating as Seaside AA 4 star Guest House accommodation. Ideally located for theatres and seafront, only a 3 -5 minute walk to town centre, various sports centres within 3 mile radius. The Sherwood have a Beach Hut available for our guests to use on a First Come First Served basis. Children welcome from age 8. Follow signs from all major routes to Eastbourne seafront. Once on the seafront, Lascelles Terrace is located between the Pier and the Wish Tower, next door to The Devonshire Park Theatre. A short taxi ride away from the train and bus station.